Have you seen printable paper toys? I can’t get enough so I thought I would share them with you! All projects include a free printable so that you can easily make your own. ;Simply click the title below the image to get to the craft tutorial. Easy DIY craft tutorial ideas for free printable paper toys. Paper toys are fun to make and fun to play with. What is your favorite type of printables? Share and leave a comment below! 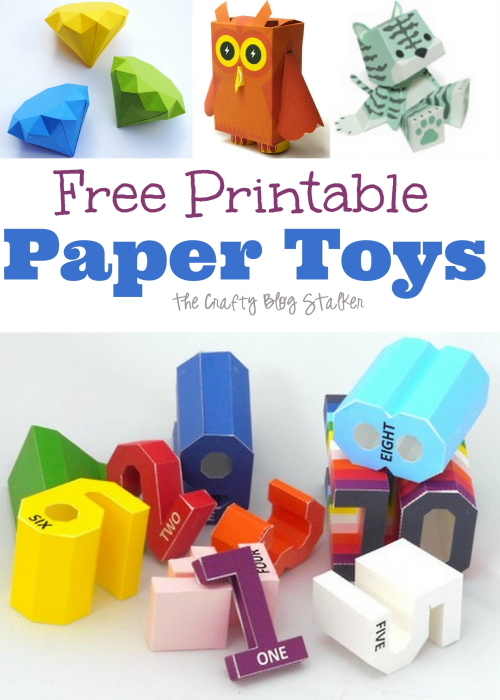 SAVE FREE PRINTABLE PAPER TOYS TO YOUR FAVORITE DIY PINTEREST BOARD! What Can You Make With a Pair of Socks? These are all so fun!! So cute! I am going to pin this. Found you on Link n Blogs link party! These are great! My little ones would love the Hello Kitty! Pinning!! Thank you! ADORABLE! How skilled do you have to be to make these though!?? I think it depends. IF it is your first time I would suggest starting with a more simple and square one. The more you’ve done the more you will be able to do the more difficult paper toys. These are awesome! I think I would have fun playing with them! 🙂 My boys sure would love the Disney ones. I can see I’m going to be needing more printer ink. These are brilliant. Ive seen letters before but not numbers. When I find the time, I’m going to make a set for my friend who has just had a baby. Her nursery wallpaper on one wall is numbers. I LOVE the letters!! I am going to have to save those for my son for his fall curriculum!! Just got thisin my Pinterest feed. What I want to know, is how to easily convert these to svg files so I can cut them out using my Cricut Explore. They’re really cute, but I know I don’t have the dexterity or patience to cut these out by hand. Any tips? is anyone starting to offer printables as svg or cricut files for paper at like this? I am sorry, but I am not quite sure how to convert them to SVG and keep them so they are printable. There might be a tutorial video on YouTube that you could watch. I am sorry I couldn’t help. Great Wonderful Creativity. All are Awesome but The alphabets are fabulous!